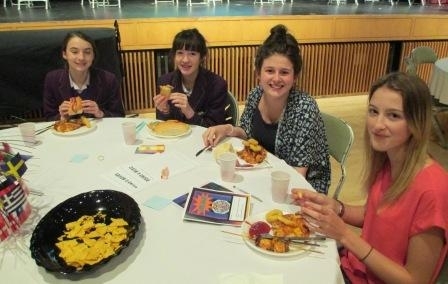 On Tuesday evening, the Languages Department hosted the first ‘Languages Quiz Night’ for Year 10 students. Students competed in teams of four, sporting team-names such as ‘The Four Musketeers’, and some of Miss Widnall’s Spanish students showing their devotion with ‘Widnall’s Wanderers’. Students were faced with five rounds of questioning, each making them work together and unite their knowledge’s of languge and cultural, with a grand prize at stake for the overall winners. Round one saw pupils face a taxing ‘Language Round’, allowing students to show off what they had learnt in lessons, with our Language Assistants aiding Mr. Oracz with pronunciation of some of the more difficult questions. As students encountered a taxing question, they utilised their ‘Phone-a-Foreign-Friend’ cards, which they cashed in for help by a member of staff or assistant. In the second round pupils were given four options to choose from via a probing PowerPoint, all aimed on aspects of culture. Listening to the students reasoning as to why a certain pictures may be the odd one out proved amusing, as comments such as ‘he is much better looking than the others’ entertained each team as they attempted to narrow down the options. Pupils’ attentions were drawn to the stage in the third round, where sixteen seats had been set up prior to the event. What followed was a mixture of emotions from students, as they attempted to win extra points for their teams by tasting foods and guessing what they were, whilst being blindfolded. The third round whetted the students’ appetites, which led perfectly into their evening meal, which had been prepared by Mrs. Ballan and our very own Westholme catering staff. They really outshone themselves, as they prepared a sumptuous banquet of delectable cuisines, all relevant to different cultures, very appropriate for the theme of the night. Students were found going back for second and third helpings so greatly did they enjoy what was on offer. In addition to this, Miss Widnall and Mrs Saunders prepared a thirst-quenching non-alcoholic Sangria, which again proved very popular amongst one and all. The final rounds were made up of a modern music round, which led to the room being filled with song as the students filled the theatre with their voices, singing along to their favourite tracks, and a movie round, with students answering questions on a number of clips from famous foreign films. A fantastic evening was had by both students and staff alike. Congratulations to the winning team ‘Areo’ who scored 93/123! Special thanks must go to all members of staff and support staffs who were involved in the evening, with a particular mention going to the Languages Department. Thanks also to Mr. Scott for providing his usual technological flair, to the catering staff for their stunning banquet, to the sixth formers who helped throughout the evening, and to the Marketing Department and Mrs Booth, who have a hand in promoting the evening and donating prizes for the winners on Thursday.